I should have written this months ago, while all the memories were fresh, but sometimes you need a little time for an idea to find its place in your mind and sort itself out – perhaps this is one of those times. A few months back we were at GDC in San Francisco. For the first time we took a risk and bought some booth space on the Indie floor sharing a slot with our friends at OmegaTech. Not being exactly organized we brought three things to show: a working build of Stargate SG1 Gunship, an alpha build of G Prime and a banner for Redwall. (Memo to self: next time try ‘focus’) G, for all the pretty screenshots, really wasn’t a good choice for a booth show – it’s more of a thinker really, and only alpha. SG1 showed pretty well. 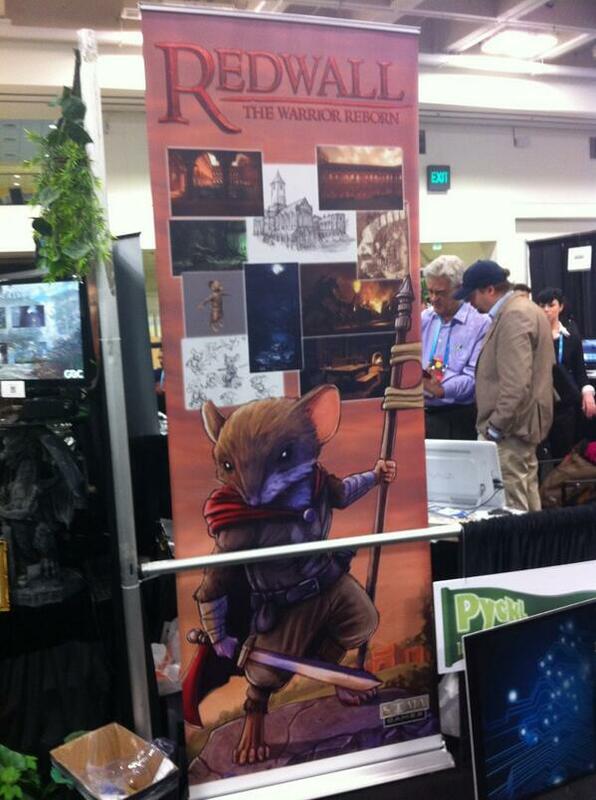 People seemed to like what we’d done with the UI, but far and away we had the most response to Redwall…even though we had nothing to show but a banner. Seriously I was shocked…again. At times we had folks four and five deep around our tiny little table and at other times people were literally throwing resumes at us. Tweets and posts and selfies, all because of the way this series of books has touched people. There was a no-man’s-land of open seating adjacent to our booth and I could sit there inconspicuously watching as people would come up to the banner and take long pauses as if they were reliving fond memories. Sometimes they’d want to ask us questions but more often they just looked wistfully on at the sandstone walls and the setting rose-colored sun and seemed to be moved, almost to reverie. Ever since the iPhone started to eat into the smartphone space like one my famished coffee-bean-headed farm zombies we kept waiting for RIM to respond and as months turned into years we started to think they’d lost it. “it” being both the HUGE advantage they had worked hard to gain with the brilliance of the click-wheel and also their collective minds. By January this year I had crossed my confidence tipping point and figured BlackBerry for the walking dead – still shambling about but done nonetheless. Then at GDC I got a very pleasant surprise – the soon-to-be-released BlackBerry Playbook. Will the next 10 years bring gaming up into something more relevant, more mature, and more important that feeds our souls and inspires us to live well or will better technology only drive gaming ever deeper down into our id with hyperrealistic gore – always feeding our basest nature?